CoolCanucks Blog Contest ~ UV Skinz Review & Giveaway!! I give a huge kudos to this com­pany, and absolutely rec­om­mend UV Skinz to every­one!! I had the plea­sure of being able to review a chil­drens short sleeve UV Skinz swim shirt, match­ing board shorts and a reversible bucket hat in size 3T! It is so adorable beyond belief! It’s colours are orange and navy stripes, and very sharp look­ing!! I def­i­nitely rec­om­mend that every­one dress their fam­ily in UV Skinz. The cus­tomer ser­vice I received and the deliv­ery time were com­pletely outstanding!! Win It!! Enter my sweep­stakes give­away below for a chance to win this exact out­fit in your choice of size!! Open to Cana­dian & US res­i­dents only. I give a huge kudos to this com­pany, and absolutely rec­om­mend UV Skinz to every­one!! The cus­tomer ser­vice I received and the deliv­ery time were com­pletely out­stand­ing!! I was sent one of their pop­u­lar adult UV Skinz tops in the colour Sky Blue and I absolutely love it!! It is so com­fort­able and styl­ish, and I am com­pletely sold on UV Skinz! The very kind and gen­er­ous Rhonda over at UV Skinz has gra­ciously offered to give one lucky Cool­Canucks reader the chance to win one item of their own choice from the UV Skinz web­site!! SWEET!! 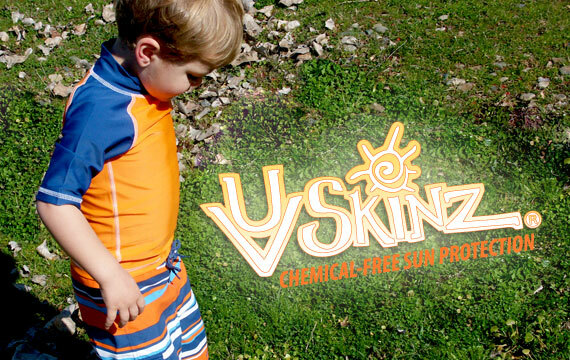 1) Head on over to UV Skinz and look at all of their fab­u­lous prod­ucts! Tell me which item that you would love to have! •Fol­low @coolcanucks and @UVSkinz on Twit­ter! Leave me your twit­ter name! Become a Fan of UV Skinz on Face­book and leave a com­ment on their wall that you came from Cool­Canucks! •Pur­chase any­thing from UV Skinz for the dura­tion of the give­away and get 10 extra entries!! Just tell me in a comment! A HUGE thank you to UV Skinz for spon­sor­ing us with this GREAT Con­test here at CoolCanucks! !